Cuando su crucero llegue al puerto de Cartagena, disfrute de las principales atracciones de la ciudad con facilidad en este recorrido de medio día privado. Durante su excursión de 4 horas, se dirigirá a lo largo de La Manga con un guía privado y admire las magníficas vistas sobre el faro de Cabo de Palos y la reserva marina. 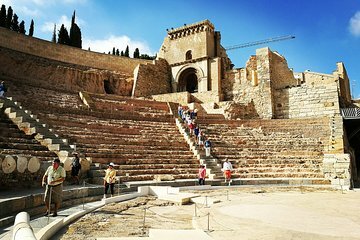 Explore la historia romana en la muralla Púnica de Cartagena y la bahía de Portman y descubra los monumentos más emblemáticos como la Casa de Cervantes, el Grand Hotel, La Concepción y el Teatro Romano de Carthago Nova. A continuación, relaciónese con los lugareños durante un paseo a lo largo de la bulliciosa Calle Mayor. Our private guide Ana gave us a personalized, air conditioned car and walking leisurely but jam packed and informed tour of Cartegna. She was sensitive to the slower pace of a hip and knee challenged tourist like me but never made me feel awkward. Cartegena is rich in history and recently discovered Roman ruins. We explored excavation sites that included part of a 2 story 30 foot tall and 15 foot wide Phoenician wall that housed horses and soldiers within its walls, a Roman forum with thermal baths, a huge Roman theatre as well as a Roman coliseum that now hosts bull fights. The amazing thing is that many of these ancient treasures weren't discovered until the 1980's. They had been covered over and built upon, preserving many treasures that might otherwise have been plundered. Thee excellent new museums cover the Punic wall and Roman theatre and the Roman Baths. You can actually walk through different rooms within the forum complex which is an ongoing excavation site. We ended our explorations with a delicious tapas lunch in a youthful restaurant venue that dates to the 1600's. The owner played the fiddle slicing us delicious Parma ham... Like prosciutto but different.